In 1950 Lionel was celebrating its Golden Anniversary. Several new products were announced in that year's catalog, including the 773 Hudson, Alco diesels, and accessories such as the 455 Oil Derrick and 456 Coal Ramp. Another new accessory was the 213 Lift Bridge. This item would be taking over for the popular 313 Bascule Bridge. 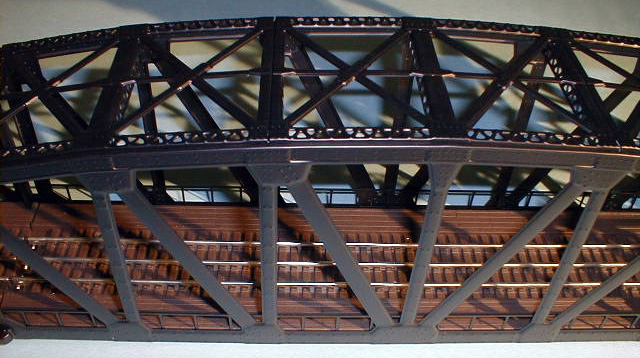 While the other items mentioned above were produced, the 213 Lift Bridge never was. 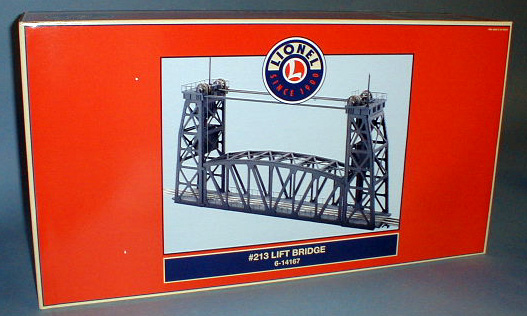 In 1991, Lionel Trains, Inc. produced a huge operating lift bridge loosely inspired from the design of the Postwar version. 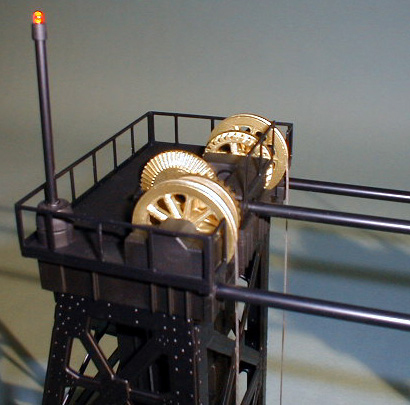 The 12782 Operating Lift Bridge was made of sturdy plastic and included electronic bell and warning horn sounds. 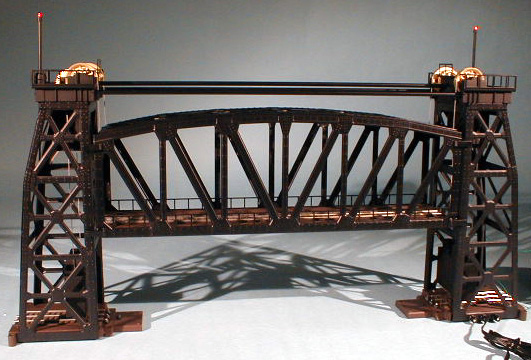 This bridge is Lionel's largest operating accessory, and commands between $600 and $700 in the collector's market of today. And now Lionel has produced a new lift bridge. The style is similar to the Postwar prototype and has been assigned the same number, 213. The shipping carton is big, measuring approximately 39" X 9" X 19" and weighs 18 pounds. Made in China, the bridge is very well-packed and some assembly is required. It is recommended that you read the instructions before setting the bridge up. Best operation will be on a permanent layout, or at least have the bridge piers secured to the layout surface. There are four screws that hold the span safely to the base to avoid damage in transit. These must be removed for operation. There are four small cables included that must be connected to the bridge span and two counterweights. I set the span on a set of books to raise it between the piers. This allowed me needed flexibility inside the piers to attach the counterweights to the cables. The cables rest on the four pulleys at the top of the piers. Take care to correctly connect the warning lights on top of the piers. They do not blink. The directions for electrical connections do not specify 'A' or 'U' for the bridge power supply. I connected the first terminal to power and the second to common and the bridge operates fine. The controller is a single switch controller as used for the O-27 automatic switches. One of the wires (which is part of the 3-conducter cable) has a texture to it. This lead is connected to the center post. Additional connections can be made to automatically stop an on-coming train from running into the raised bridge. Operation is simple. The controller lever moves the span either up or down. There is no automatic shut-off. One simply has to be smart enough to stop the span from rising too high. The counterweights are sufficiently heavy enough to do their job. They are encased in plastic, so even if they touch the rails, they won't cause a short. The vertical clearance is about 4.25-inches. I slid a scale K-line double-decker passenger car through there and there was maybe 3/16" to spare. There is no sound feature. The bridge itself is a beautiful sight. Although it is tinplate, it looks very realitic and detailed. 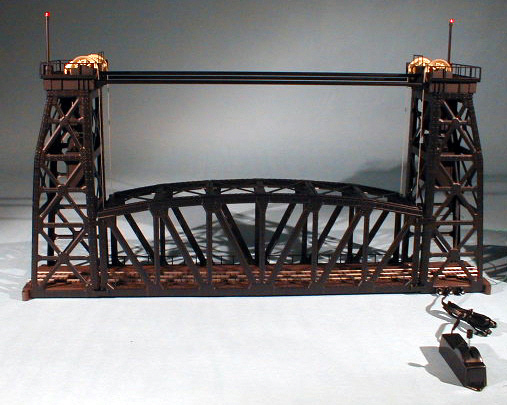 The black is more realistic for a railroad bridge, but I wouldn't be surprised to see it re-issued in silver sometime. The embossed rivet detail is very strong. The diecast golden gears on the top are the greatest feature. They gracefully turn as the span slowly raises and lowers. The motor is a DC-type, and runs quietly. At 16 volts, it takes about 27 seconds for the span to completely raise or lower. Be mindful of small children who might direct a curious finger too close to the geared mechanism. The motor is housed under the top of one pier. It directly drives a set of gears which raise one side of the span. The center bar turns (like the Postwar version was designed to do) and drives the gears of the pier on the other side without the motor. The span should not have a problem remaining level throughout operation. After you first install it, you should make sure that both ends are completely lowered before operating it. This is now one of my favorite accessories.